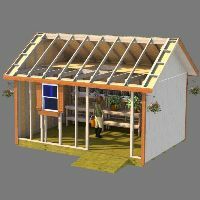 Shed foundation piers are one way of anchoring your wooden shed floor. Most if not all sheds that I build with wooden floors are anchored with a minimum of 2 to 4 piers set in concrete. Does Your County Require Shed Foundation Piers? 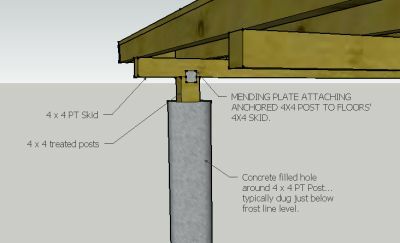 I have found that most counties in the vicinity of where I live want you to use a 4x4 treated post (pier) anchored in concrete in a hole that is dug just below the frost line. 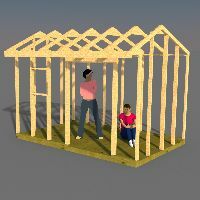 And, this is one of the most commonly accepted methods of anchoring a shed down. Personally, I would always use 4 shed foundation piers in concrete. One for each corner, with blocking under the skids spaced out evenly between the concrete anchors. You can see that the floor has 4x4 skids or runners as supports for the floor joists on this example. This particular example has 3 4"x4" skids under the floor and at each end of the outside skids, about 1' in from the end is a concrete anchor. These 4"x4" treated posts are usually set in concrete in a hole that is a minimum of 6", usually 8", and dug to a minimum depth equal to your areas frost line. The piers are 'held' on to the skids with either mending plates on each side, or post caps. Either method should be acceptable but it is always a good idea to check with your building inspector first before proceeding with this method of anchoring your shed floor. 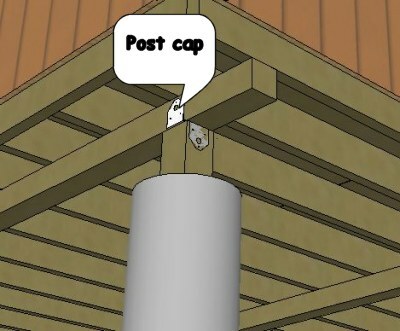 Since foundation piers of this manner are used to anchor the shed down, you will also probably need to add additional supports under the floor skids in between the anchors. This can be accomplished by using 2x4's stacked on top of each other from the ground up to the skid. You can also use concrete blocks stacked on each other. Usually on the shed floors I build, I will have a minimum of 2 concrete foundation piers, up to 4. Then I will use the blocking described above spaced evenly between the anchors about every 4' or so. 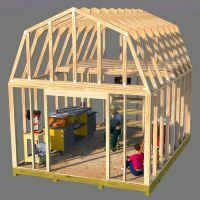 If your shed has 3 runners, the middle runner can just be supported with the blocking at equal intervals, usually about every 4'. 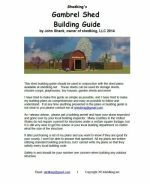 I always suggest that buyers of my storage shed plans check with their local building inspector to make sure which method of anchoring your shed floor is acceptable in your particular locality. Leave shed foundation piers for shed foundation.